Laia is determined to break into Kauf - the Empire's most secure and dangerous prison - to save her brother, who is the key to the Scholars' survival. And Elias is determined to help Lai succeed, even if it means giving up his last chance at freedom. But dark forces, human and otherworldly, work against Lai and Elias. The pair must fight every step of the way to outsmart their enemies: the bloodthirsty Emperor Marcus, the merciless Commandant, the sadistic Warden of Kauf, and most heartbreaking of all, Helene - Elias's former friend and the Empire's newest Blood Shrike. Bound to Marcus's will, Helene faces a torturous mission of her own - one that might destroy her: find the traitor Elias Veturius and the Scholar slave who helped him escape...and kill them both. As the description about describes, Elias and Laia are on the run, attempting to escape Serra with their lives, and on a mission to reach the prison at Kauf to rescue Laia's brother. That, of course, is easier said than done. The Martial army, the Commandant, and Helene, the Emperor's new Blood Shrike, are right on their tail. I think I'm going to leave it there. This is a journey book, and if you like journey books, you'll like this one. I don't mind journey books, but with all of the action of An Ember in the Ashes, this felt a smidgen slow. Just a smidgen. Sabaa Tahir is that good. Seriously. This story, while filled with intrigue and suspense, is a character story. And you really fall in love with the characters. The Commandant is terrifying. She is quickly traveling up the ranks of my most feared fictional villains. She's ruthless, conniving, and violent. 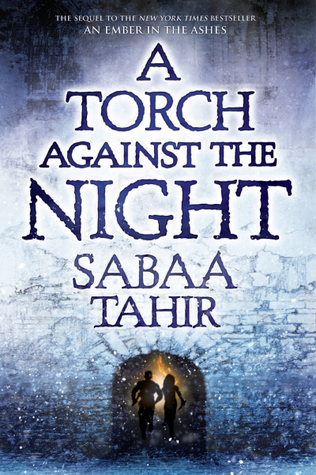 As series sequels go, A Torch Against the Night is excellent. The story progresses with additional obstacles thrown into the mix. The characters continue to develop, moving toward who they will need to become for a final resolution. And it's just exciting (despite the smidgen of slowness). On a sidenote, I listened to the audiobook. That is how I devoured the first, which means it was the only way I could devour the second. Plus, Fiona Hardingham is a reader, and Fiona Hardingham can do no wrong. Hilariously, the Warden at Kauf reminded me A LOT of the Six Fingered Man in the Princess Bride. The cadence they chose to use for his voice made him both creepy and intriguing. I can't wait for book three!